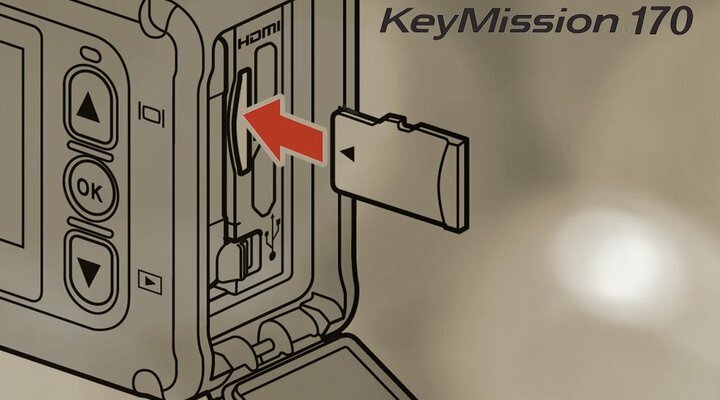 The KeyMission 170 utilizes a MicroSD media card. There are three types of MicroSD cards: MicroSD, MicroSDHC, MicroSDXC. All are the same physical shape, however the speed rating and maximum capacity of the cards vary and this is what makes each more suited for certain kinds of devices. To record video on the KeyMIssion 170 action camera you should use at least a Class 6 UHS (Ultra High Speed) 3 MicroSDXC card. A Class 10 UHS 3 MicroSDXC card is recommended for shooting 4K UHD and Full HD video. If you use a slower media card, the camera will not be able to record more than a few seconds of video before it stops recording. As with other media cards, always format the memory card with the KeyMission camera when you first insert it in this device if it was used in another camera. Remember that when you format a media card, all images or videos on that card will be deleted so make sure you have those files backed up to a computer. Carefully insert the media card into the media card slot. Do not force it. If a media card is inserted incorrectly it can damage the camera or card. To eject the media card, gently push on the media card and it will partially eject so you can pull it out. For more detailed information, review the reference manual and quick start guide that came with your KeyMission action camera.